Armenian-American leaders and human rights advocates have expressed deep reservations about the nomination of Chuck Hagel to lead the defense department. Hagel, a two-term Republican senator from Nebraska, was nominated Monday as President Barack Obama’s pick to head the Pentagon. He faces criticism for opposing a 2005 congressional resolution recognizing Turkey’s genocide of more than one million Armenians. "What happened in 1915 happened in 1915," Hagel said during a 2005 trip to Armenia when he was serving in the Senate. "As one United States senator, I think the better way to deal with this is to leave it open to historians and others to decide what happened and why." "The fact is that this region needs to move forward," Hagel continued. "We need to find a lasting, just peace between Turkey and Armenia and the other nations of this region. I am not sure that by going back and dealing with that in some way that causes one side or the other to be put in difficult spot, helps move the peace process forward." Armenian-American leaders and genocide experts decried these comments as insensitive and dangerous. They maintain that Hagel’s willingness to overlook the systematic genocide of more than one million people raises concerns about his possible tenure as the nation’s top defense official. "Senator Hagel’s remarks from 2005 ignore a proud chapter in U.S. history during which America’s diplomatic community played an important role denouncing human rights violations and setting an example of humanitarian assistance on behalf of a people at risk," said Bryan Ardouny, executive director of the nonpartisan Armenian Assembly of America. "The fact of the Armenian Genocide is incontestable, and not only recognized by Nebraska’s Governor in 2004, but also has been repeatedly confirmed by the International Association of Genocide Scholars, a preeminent body dedicated to the study of genocide, its consequences, and its prevention," Ardouny said. "We expect a rigorous confirmation process which will also serve as an opportunity for Senator Hagel to forthrightly acknowledge the U.S. record on the Armenian Genocide." The Armenian National Committee of America (ANCA) also stated that it is "troubled" by Hagel’s comments, which it claims displays a willingness to adopt Turkish propaganda aimed at whitewashing the genocide. "We remain troubled by former Senator Hagel's acceptance of Ankara's gag-rule on American honesty about the Armenian Genocide—the still unpunished crime against a Christian nation that continues to define Turkey's present-day policies toward Armenia and much of the region," ANCA Executive Director Aram Hamparian said in a December statement released prior to Hagel’s nomination. "As much as [Turkish Prime Minister Recep Tayyip] Erdogan and his allies might like, the ‘lasting, just peace between Turkey and Armenia' that Chuck Hagel seeks cannot be built on Genocide denial," Hamparian said. "The U.S. and the international community must set an example by condemning the Armenian Genocide—and speaking out against all genocides, wherever and whenever they occur." "On the eve of the Holocaust, Hitler mockingly asked, ‘Who, after all, speaks today of the annihilation of the Armenians?' Not Chuck Hagel, apparently," Rafael Medoff, director of the David S. Wyman Institute for Holocaust Studies, told the Washington Free Beacon. "Sweeping genocide under the rug in the name of political expediency, as Senator Hagel recommended with regard to Turkey and the Armenians, is not only wrong but dangerous, because the failure to acknowledge past genocides paves the way for future genocides," Medoff said. Other prominent human rights leaders dubbed Hagel’s remarks as "shameful." "What Chuck Hagel said in his press conference in Armenia in 2005 regarding the genocide of Armenians by Turks is shameful," said Walter Reich, a former director of the United States Holocaust Memorial Museum. "In his forthcoming confirmation hearings, senators should confront him with what he said and should expect him to address it." "I believe he should apologize for it not with the kind of perfunctory apology that’s routine and therefore meaningless in Washington’s public life but with a response that makes clear that he understands why he was wrong," said Reich, who serves as the Yitzhak Rabin Memorial Professor of International Affairs, Ethics, and Human Behavior at George Washington University in Washington, D.C.
Hagel disgraced the memory of those murdered by stating that Armenians should move past the genocide, Reich added. "It's a disgrace—and a disservice to the memory of the victims—to say that their murder should be forgotten in the service of ‘the peace process,’ as if a real peace process is possible if one hides or ignores or mischaracterizes what actually happened," Reich said. "The victims deserve better. History deserves better. Memory deserves better," Reich said. "And, in its Secretary of Defense—whose actions and opinions, if Hagel is confirmed, will be central to the formulation and execution of American policies that will affect the world, especially parts of the world in which history and memory are very sensitive matters—America deserves better." Human rights scholar Thane Rosenbaum said Hagel’s opposition to U.S. recognition of the Armenian genocide "betrays a shocking lack of moral leadership." The issue of the Armenian genocide remains a political third rail in Turkey, which refuses to acknowledge its role in the systematic slaughter of some 1.5 million Armenians in the early 1900s. Turkish lobbying groups in the U.S. have long pressured U.S. lawmakers to avoid acknowledging to the genocide. Many U.S. leaders, including Obama and Hagel, have acquiesced to this demand in order to maintain good relations with the Turkish government, a critical Middle East ally. Human rights leaders and others maintain that the Pentagon deserves a principled leader who will uphold the moral high ground. Hagel’s position on the Armenian genocide, they say, suggests that he is willing to forsake morality when it becomes politically convenient. "These are not principled positions because they’re filled with hypocrisy," said Rosenbaum, a law professor at Fordham University in New York. Hagel has displayed "a fundamental misunderstanding of humanity," Rosenbaum said. The Simon Wiesenthal Center also expressed "deep reservations" about Hagel for this and other reasons. 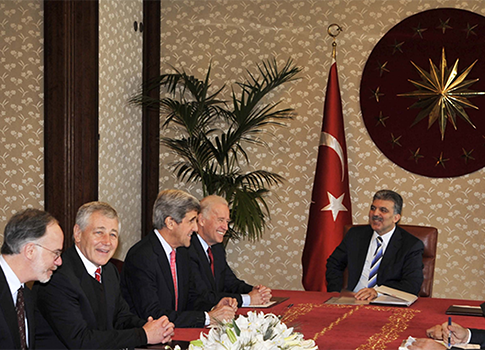 The Turkish press, however, has praised Obama’s selection of Hagel. Various Turkish news reports hailed Hagel for his pro-Turkey and anti-Israel views. He also has received support among Turkish columnists for his past efforts to weaken economic sanctions on Iran. Hagel has faced fierce opposition from lawmakers and Jewish leaders for his comments that they say are anti-Israel and anti-Semitic. He has also been criticized for anti-gay comments and for taking a soft stance on Syria. This entry was posted in National Security, Politics and tagged Barack Obama, Chuck Hagel, Iran, Middle East, Pentagon, Secretary of Defense, Syria, Turkey. Bookmark the permalink.